What is the Path of Liberation? 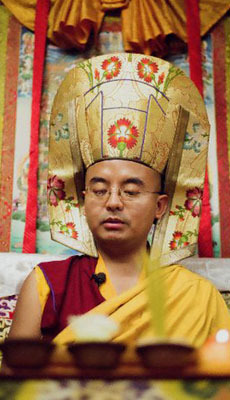 The Path of Liberation is an experiential path of meditation for those who wish to practice the Buddhist teachings under the guidance of Yongey Mingyur Rinpoche. Encompassing the most important practices of the Kagyu and Nyingma lineages of Tibetan Buddhism, and building on the foundational teachings of the Joy of Living, the Path of Liberation presents a series of meditation techniques designed to strip away the causes of suffering and uncover the radiant awareness that underlies all experience. There are two tracks in the Path of Liberation. Each track is designed for a different set of circumstances. The first track is based on a short practice liturgy entitled Nectar of the Path and is designed for people who have roughly 30–60 minutes for their daily meditation practice. The second track is based on a traditional liturgy for ngondro entitled The Chariot for Traveling the Noble Path. This track works best for those who can practice between one and two hours each day. Both tracks culminate in the practice of a White Tara Sadhana entitled Radiance of the Heart. What are the prerequisites for beginning the Path of Liberation? To begin the Nectar of Path track it is necessary to take refuge and receive pointing out instructions on the nature of mind from a Buddhist lineage holder. 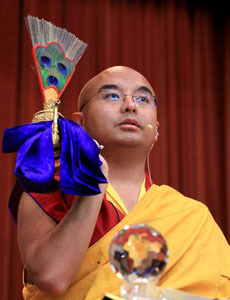 To begin the Ngondro track you will need to take refuge, receive the reading transmission for the ngondro liturgy (Chariot for Traveling the Noble Path), an empowerment, and instructions on the ngondro practices, as well as receive pointing out instructions on the nature of mind from a Buddhist lineage holder. All of these transmissions are given at Tergar’s Path of Liberation retreats. If you are not sure if you meet these prerequisites, please email study@tergar.org to check with a Tergar Instructor. What practices are included in the Path of Liberation? Both tracks of the Path of Liberation include two different forms of practice: nature of mind practices and practices that involve contemplation and/or the imagination. Nature of mind practices put us directly in touch with our awakened nature — the radiant purity of awareness. Contemplations and practices that use the imagination bring us to the same place, but they do so by dissolving the habits that keep us from seeing our awakened nature. How are the two tracks of the Path of Liberation different? As described above, the Nectar of the Path track is designed for people who have roughly 30–60 minutes for their daily meditation practice. The ngondro track works best for those who can practice between one and two hours each day. The two tracks contain many of the same elements. They both include the four thoughts — four contemplations that turn the mind toward the path of awakening — as well as the practices of going for refuge, arousing the altruistic mindset of bodhichitta, and guru yoga. The ngondro track also includes the practices of Vajrasattva and mandala offering. Nectar of the Path is a much shorter practice liturgy. Daily practice in this track thus involves less chanting and more time for contemplation and nature of mind meditation. The ngondro practices are more time intensive, and therefore leave less room for periods devoted exclusively to nature of mind practice. In terms of the total amount of practice time needed to complete each path, the ngondro track takes considerably longer (see below for more detail). Finally, completion of either track will enable students to receive advanced nature of mind teachings, but only the ngondro track will authorize students to practice the Vajrayogini Sadhana and the Six Yogas of Naropa. How long will it take to complete the requirements for each of the two tracks? The total time commitment for the Nectar of the Path track is 500 hours. The ngondro track requires a total of 100 hours of contemplation, 111,111 repetitions of each of the four main ngondro practices and 200 hours of nature of mind practice. Although it depends on the individual, this path takes roughly 2,000 to 2,500 hours of practice to complete. Thus, the Nectar of the Path track could be completed in roughly three years with 30 minutes of daily practice, while the Ngondro track would take roughly four or five years with 90 minutes of daily practice. How do I begin practicing the Nectar of the Path track? 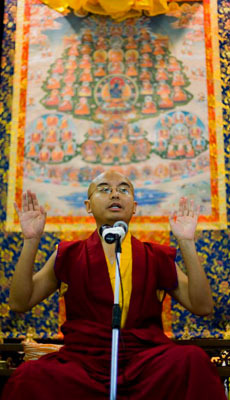 Attend a Path of Liberation retreat with Mingyur Rinpoche or Khenpo Kunga, such as our annual Exploring the Nature of Mind summer and winter retreats to receive the instructions, teachings and empowerments you need to begin practicing this track. If you have previously received pointing out instructions on the nature of mind from an authorized Buddhist teacher in either the Kagyu or Nyingma lineages of Tibetan Buddhism and are interested in beginning this track, please email study@tergar.org to determine if you meet the prerequisites. If you have received these transmissions and would like to begin practicing the first and second levels, you should enroll in Vajrayana Online, which contains a Nectar of the Path course that includes the teachings and instructions needed to do the practice. If you have questions about this track, please email study@tergar.org to check with a Tergar Instructor. How do I begin practicing the ngondro track? 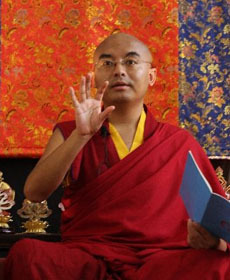 Attend a Path of Liberation retreat with Mingyur Rinpoche or Khenpo Kunga, such as our annual Exploring the Nature of Mind summer and winter retreats to receive the instructions, teachings and empowerments you need to begin practicing this track. If you have previously received pointing out instructions on the nature of mind from an authorized Buddhist teacher in either the Kagyu or Nyingma lineages of Tibetan Buddhism and are interested in beginning this track, please email study@tergar.org to determine if you meet the prerequisites. Path of Liberation retreats include these transmissions. If you have received pointing out instructions and would like to begin practicing the first level, you should enroll in Vajrayana Online, which contains a Ngondro course that includes the teachings and instructions needed to do the practice. If you have questions about this track, please email study@tergar.org to check with a Tergar Instructor. What if I am not sure which track to choose? The Tergar Instructors are always available if you need guidance on choosing a practice. 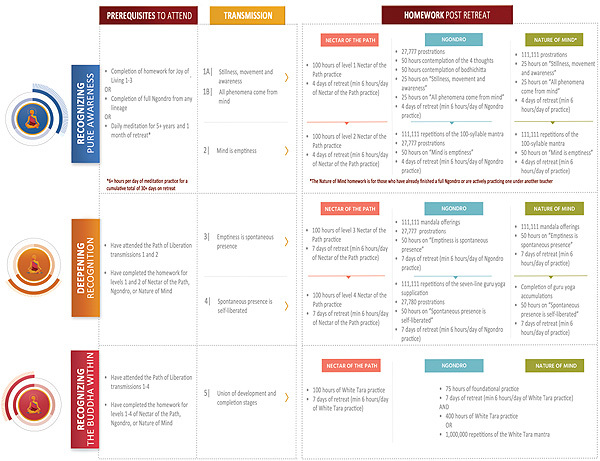 If you are not sure which track to choose, you can start with Nectar of the Path and switch to ngondro later on. The most important point is to choose the option that works with your circumstances. You can always adjust later on and receive guidance from a Tergar Lama or Instructor. What if I have already completed the 4 x 111,111 ngondro? 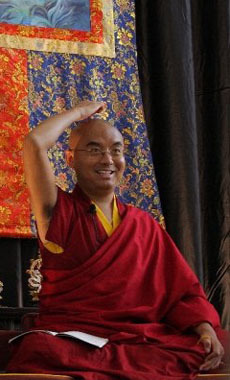 If you are an experienced Vajrayana practitioner and are actively practicing, or have already completed, the full ngondro, you can attend “Transmission for Levels 1 & 2: Recognizing Pure Awareness” at a Path of Liberation retreat to receive nature of mind instructions from Mingyur Rinpoche or Khenpo Kunga. The practice requirements for each level will consist of completing 50 hours of nature of mind practice and a certain number of days of practice in retreat, in addition to continuing with your existing practice (for those who have not yet completed the full ngondro). Detailed instructions can be found in the practice guide available in Vajrayana Online. How do I progress through the five Path of Liberation levels? Both tracks include five levels. Nectar of the Path meditators practice each part of the practice for 100 hours before moving on to the next stage. Ngondro meditators practice each practice to the completion of a certain number of repetitions, plus 50 hours of nature of mind practice for each level. Both tracks also include a certain number of days of retreat practice for each level. Guides are available that provide details about the specific requirements for each level. These guides, as well as video instructions by Mingyur Rinpoche, additional practice instructions with the Tergar Instructors, and much more, can be accessed in the Nectar of the Path and Ngondro courses in in Vajrayana Online on the Tergar Learning Community website. Once you have completed the number of hours/repetitions and retreat days specified for that level, you can move on to the next stage of the path.